Mason Wartman, owner of Rosa’s Pizza in Philadelphia, PA. is a pretty laid back guy with a pretty great story. 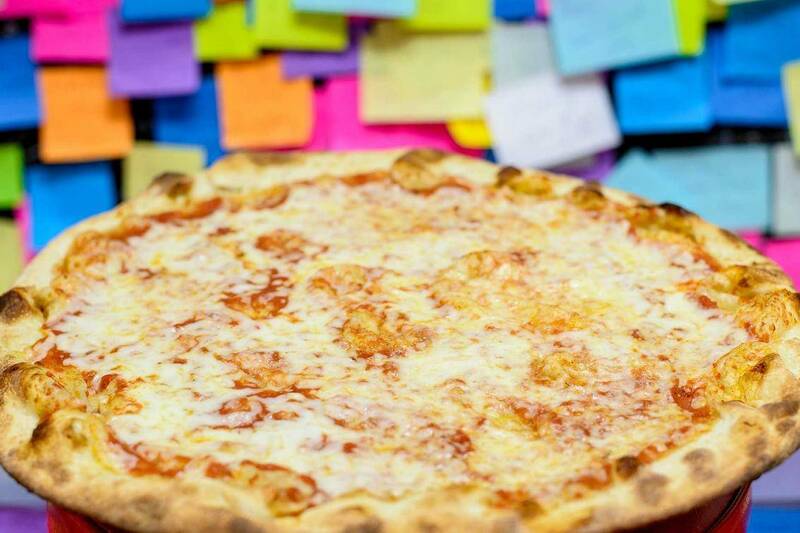 After spending some time working on Wall Street after college, he decided to return home to fulfill his simple dream of making pizza and selling slices for $1 each. But the story doesn’t end there. You see, something special is happening in Washington, D.C. this week. On April 16, 2016, 24 winners will receive the #RareUnder40 award from Rare.US, a website that covers covering politics, lifestyle, and culture news. Each winner is between the ages of 18 and 39 and is doing some pretty incredible things. I loved learning about all of this years’ recipients, but what really hooked me was the way Mason allowed his community to inspire him and how he responded as a business-owner. I reached out to Mason for some Q&A and I’m excited to share a bit more about him and help celebrate his RareUnder40 win! 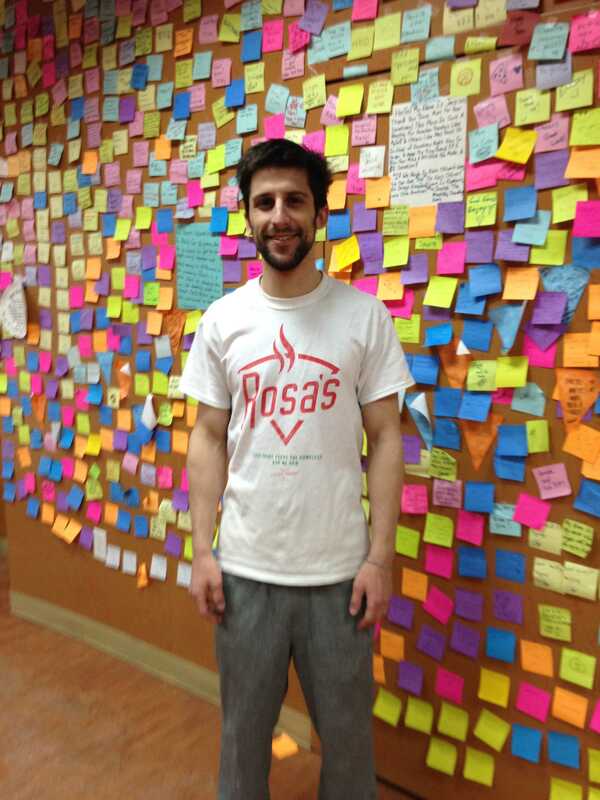 Rosa’s started as a $1/slice pizza joint. Mason wanted to make it affordable so anyone could get a hot meal. But when a customer bought a slice for the next person to pay-it-forward, a movement was born! Rosa’s now feeds approximately 100 homeless people daily. Andrea: Congratulations on your Rare Under 40 Award! Can you tell us a little bit about your background and what made you initially leave Wall Street? Mason: I started working on Wall Street after I graduated Babson College in 2010. My dad and maternal grandfather owned their own businesses and I had always wanted to start something like that, but never had a good idea. I saw the $1 pizza shops proliferate throughout New York and I thought it was a concept that could work back home in Philly, so I quit my job and came home to start Rosa’s. 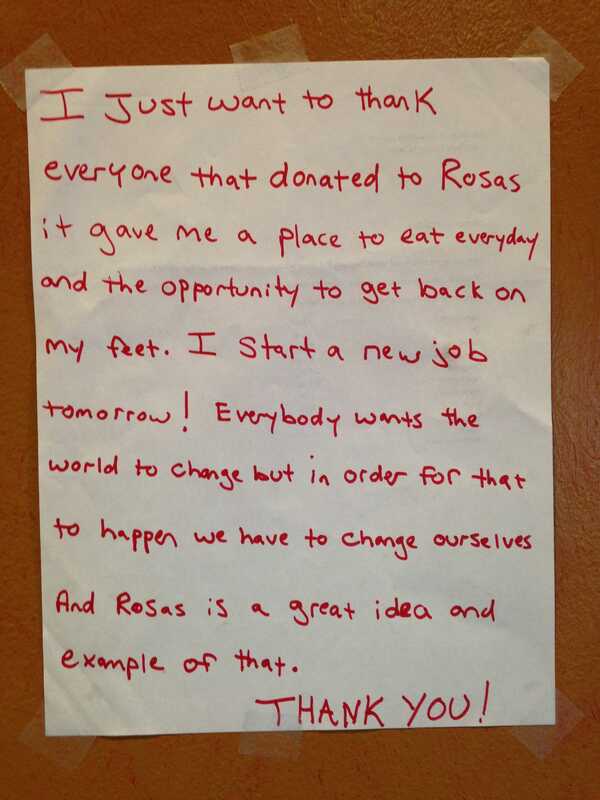 Andrea: I love the pay-it-forward aspect of Rosa’s. You mention how that first customer inspired you to feed the homeless one slice of pizza at a time. Can you share a moment or two since then that had an impact on you? Mason: The first time a homeless person came in and told us that he got a job and wouldn’t be coming in anymore was a really good day. It really showed me how people can dramatically improve their lives if they are given a little bit of help. Andrea: What is it like to know you have inspired so many people to make a difference? Mason: It’s a great feeling. I wasn’t expecting to be helping this many people so early in my entrepreneurial career, but it was a very welcomed surprise. It really inspires me to struggle through the tough times and work hard every day. Andrea: Many of my readers are entrepreneurs who have left the corporate world. Do you have any helpful hints for those uncertain days? Mason: Absolutely! I would say to be focused and persistent. Those are the chief qualities that I have found in successful entrepreneurs. Nobody pays any attention that Rosa’s did not make very good pizza or money or help many people for the first 6-12 months we were open. But we stayed focused on making a great product and persisted through difficulties and it all worked out. Focus and persistence. I never leave home without them. Andrea: We’d love to know what you have planned for Rosa’s in 2016 and beyond. What are you excited about? Mason: I’m really focused on building the restaurant to a couple locations to afford easy access to food for thousands of people every day. All I can say is that it’s a good day when we can take the time to inspire and be inspired by others to do great things. As a freelancer and mother who works from home, it can be tempting to feel small or like I have nothing to offer. But nothing is too small to make a difference. It’s time to embrace the impact our actions can have on others no matter how old or how young we are. Who would have thought that lives could be changed with a slice of pizza? The Rare Under 40 award aims to celebrate individuals between the age of 18-39 who have inspired, educated and brought social good to their communities. This year, winners include notable influencers like Ariel Winter, Barbara Pierce Bush, and Wesley Lowery. What I love about Mason’s story is that he doesn’t stand alone. His entire community is involved and that can inspire all of us. We might be the one making the pizza or the one donating the dollar. But these actions together are what make all the difference and they are worth celebrating. I encourage you to check out the other 23 winners and start your day with a smile. It’s never too small a thing to help someone! This post is sponsored by Everywhere Agency on behalf of Rare.US; however, all thoughts and opinions expressed are my own. Photos courtesy of Mason Wartman. What an inspiration! I remember hearing about this story in the news. It’s wonderful to see awards being granted specifically for social good within communities. I’ll revisit this story with my children, he’s such a great role-model to share with them. We need more people in the world like this man. Love this — such an inspiration to others. How absolutely amazing is this? We truly need more people like this in our world! I read about this guy last year. So great he is being recognized!